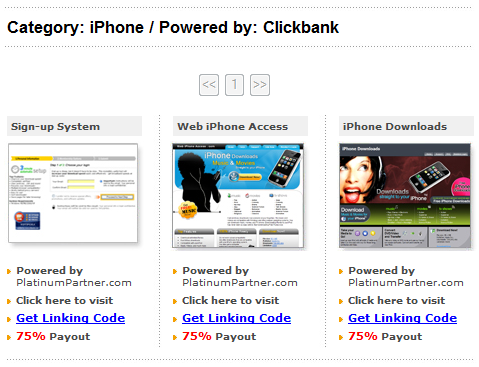 Platinum Partner is a website that showcases a number of ClickBank products that you can sell for up to 75% commission or $45.00 per sale. The site is arranged into categories and provides you with all the tools you need to make your sales. You don’t need a website of your own to use Platinum Partner, as long as you have a ClickBank account, you’re ready to go. The process is very simple. You decide what product you want to sell from the categories list and then select the appropriate site you wish to promote. For example, if I want to sell iPhone downloads, I would click the iPhone category and I’m given a list of three sites that are offering the product. See example below. Once I choose the site I wish to promote I enter my ClickBank username and the system automatically creates a linking code for me, along with HTML. From there you can promote your site of choice and wait for the commission sales to roll in. Platinum Partner also offers you banners and buttons to help your affiliate sales along. If you don’t see a banner you like, you can request that they make one for you free of charge. Isn’t that nice of them? Read the full list of features offered.